Home » Notaries » Jaumpa’s Notary 2U! I serve an area of about 20 miles from Springfield and ONLY offer mobile service. I charge $20 to meet and certify ONE signature. Each additional signature certification is $10. I have been doing this since 2002, mostly with closing Home Loans as a Signing Agent which I still perform! Call for pricing. State ID Requirements for Notary Public Acts: A Drivers license or ID card issued by the DMV. A United States passport or an officially recognized passport of a foreign country. A US military ID card. A Tribal ID card. Other government ID that includes a photo and signature. Corrections records. And provide ID and Payment before service! NO checks or debit/credit! I also offer a Confidential Document transport service. I held a Secret security clearance in the military and know the meaning of 'Confidential' documents! Springfield / Eugene and outlying areas! Mobile Signing Agent basic Notorial services and Confidential Document transport! Disclaimer: I am not an Attorney licensed to practice law. I am not allowed to draft legal records, give advice on legal matters, including immigration, or cgarge a fee for those activities! I provide a Basic Notorial service and perform Signing Agent (Home Loan Closing) duties. I do not have a Public office, so I provide my service in the privacy of your home, work office, shop, barn, hospital room, or wherever I can get my car without damage. If you do use my service, please confine your dogs from approaching me or my car. I started as a Home Loan Siging Agent in 2002 in Sacramento, CA. through the bust of 2008. In 2013 I moved to Oregon to be near family and I let my CA Notary expire. I then decided to get my Oregon Notary to help in my forced retirement income. And provide a service that gets me out of the house! 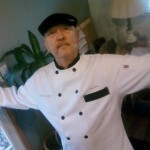 You may notice that I am wearing my 'Rent-A-Chef' chef coat. After the 2008 bust, I went back to my college thesis on a Catering business and started to get it on its feet when I developed some heart issues, so I had to scrap that. Basic Notorial Service (no issues): Meet and Certify 1 (one) signature $20. Each additional signature certification is $10 (same person or other party). Signing Agent services: I will work with you and the Title company to make sure your Closing goes smoothly and provide communication between the Loan Agent, Title Agent and all involved with the Closing process. I realize delays can be expensive and expect ALL involved be available, if only by phone, to settle issues that may arrise during the Closing meeting with the Noatary! It is NOT my job to 'Re-Close' a sale when an issue comes up. Such as 'The Note interest rate is not what I was told! ', or 'Those arent the fees I was told! '.